It typically lacks a dry season, as precipitation is more evenly dispersed throughout the year. It is the predominant climate type across much of Western Europe including the United Kingdom, the Pacific Northwest region of the United States and Canada, portions of central Mexico, southwestern South America, southeastern Australia including Tasmania, and New Zealand, as well as isolated locations elsewhere. Oceanic climates are generally characterised by a narrower annual range of temperatures than in other places at a comparable latitude, and generally do not have the extremely dry summers of Mediterranean climates or the hot summers of humid subtropical. Oceanic climates are most dominant in Europe, where they spread much farther inland than in other continents. Oceanic climates can have considerable storm activity as they are located in the belt of the stormy westerlies. Many oceanic climates have frequent cloudy or overcast conditions due to the near constant storms and lows tracking over or near them. The annual range of temperatures is smaller than typical climates at these latitudes due to the constant stable marine air masses that pass through oceanic climates, which lack both very warm and very cool fronts. Locations with oceanic climates tend to feature cloudy conditions with precipitation, though it can experience clear, sunny days. London is an example of an oceanic climate. It experiences reliable and constant precipitation throughout the entire year. Despite this, thunderstorms are quite rare since hot and cold air masses meet infrequently in the region. In most areas with an oceanic climate, precipitation comes in the form of rain for the majority of the year. However, some areas with this climate see some snowfall annually during winter. Most oceanic climate zones, or at least a part of them, experience at least one snowfall per year. In the poleward locations of the oceanic climate zone ("subpolar oceanic climates," described in greater detail below), snowfall is more frequent and commonplace. Overall temperature characteristics of the oceanic climates feature cool temperatures and infrequent extremes of temperature. In the Köppen climate classification, Oceanic climates have a mean temperature of 0 °C (32 °F) (or −3 °C (27 °F)) or higher in the coldest month, compared to continental climates where the coldest month has a mean temperature of below 0 °C (32 °F) (or −3 °C (27 °F)). Summers are cool, with the warmest month having a mean temperature below 22 °C (72 °F). Poleward of the latter is a zone of the aforementioned subpolar oceanic climate (Köppen Cfc), with long but relatively mild (for their latitude) winters and cool and short summers (average temperatures of at least 10 °C (50 °F) for one to three months). 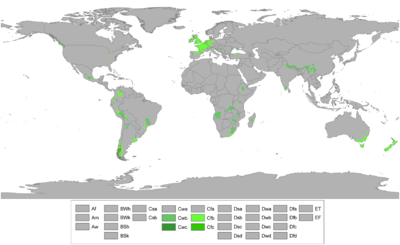 Examples of this climate include parts of coastal Iceland, and Norway, the Scottish Highlands, the mountains of Vancouver Island, and Haida Gwaii in Canada, in the Northern Hemisphere and extreme southern Chile and Argentina in the Southern Hemisphere (examples include Ushuaia and Punta Arenas), the Tasmanian Central Highlands, and parts of New Zealand. Oceanic climates are not necessarily always found in coastal locations on the aforementioned parallels; however, in most cases oceanic climates parallel higher middle latitude oceans. The polar jet stream, which moves in a west to east direction across the middle latitudes, advances low pressure systems, storms, and fronts. In coastal areas of the higher middle latitudes (45–60° latitude), the prevailing onshore flow creates the basic structure of most oceanic climates. Oceanic climates are a product and reflection of the ocean adjacent to them. In the fall, winter, and early spring, when the polar jet stream is most active, the frequent passing of marine weather systems creates the frequent fog, cloudy skies, and light drizzle often associated with oceanic climates. In summer, high pressure often pushes the prevailing westerlies north of many oceanic climates, often creating a drier summer climate (for example in the Northwest coast of America, bathed by the Pacific Ocean). The North Atlantic Gulf Stream, a tropical oceanic current that passes north of the Caribbean and up the East Coast of the United States to North Carolina, then heads east-northeast to the Azores, is thought to greatly modify the climate of Northwest Europe. As a result of the Gulf Stream, west-coast areas located in high latitudes like Ireland, the UK, and Norway have much milder winters (for their latitude) than would otherwise be the case. The lowland attributes of western Europe also help drive marine air masses into continental areas, enabling cities such as Dresden, Prague, and Vienna to have maritime climates in spite of being located well inland from the ocean. Oceanic climates in Europe occur mostly in Northwest Europe, from Ireland and Great Britain eastward to central Europe. Most of France (away from the Mediterranean), Belgium, the Netherlands, Denmark, Germany, Norway, the north coast of Spain (Basque Country, north of Navarre, Galicia, Asturias and Cantabria), the western Azores off the coast of Portugal, the south of Kosovo and southern portions of Sweden, also have oceanic climates. Examples of oceanic climates are found in Glasgow, London, Bergen, Amsterdam, Dublin, Berlin, Bilbao, Donostia-San Sebastian, Biarritz, Bayonne, Zürich, Copenhagen, Skagen and Paris. With decreasing distance to the Mediterranean Sea, the oceanic climate of Northwest Europe gradually changes to the subtropical dry-summer or Mediterranean climate of southern Europe. The line between Oceanic and Continental climate in Europe runs in a generally north to south direction. For example, western Germany is more impacted by milder Atlantic air masses than is eastern Germany. Thus, winters across Europe become colder to the east, and (in some locations) summers become hotter. The line between oceanic Europe and Mediterranean Europe normally runs west to east and is related to changes in precipitation patterns and differences to seasonal temperatures. The oceanic climate exists in an arc spreading across the north-western coast of North America from the Alaskan panhandle to northern California, in general the coastal areas of the Pacific Northwest. It includes the western parts of Washington and Oregon, the Alaskan panhandle, western portions of British Columbia, and north-western California. In addition, some east coast areas such as some higher elevations along the southern Appalachian Mountains as well as Block Island, Cape Cod, Martha's Vineyard, and Nantucket have a similar climate. The oceanic climate is found in isolated pockets in eastern Mexico. The White Mountains of Northern Arizona have an oceanic cfb climate. An extensive area of oceanic climates distinguishes the coastal regions of southern Chile and extends into bordering Argentina. All mid-latitude oceanic climates are classified as humid. However, some rainshadow climates feature thermal régimes similar to those of oceanic climates but with steppe-like (BSk) or even desert-like (BWk) scarcity of precipitation. Despite the oceanic-like thermal regimes, these areas are generally classified as steppe or desert climates. These arid versions of oceanic climates are found in eastern Washington and Oregon to the east of the Cascade Range in the United States, in the Okanagan Valley in British Columbia in Canada, Patagonia in southern Argentina, and the Atacama Desert in northern Chile. The only noteworthy area of Maritime Climate at or near sea-level within Africa is in South Africa from Mossel Bay on the Western Cape coast to Plettenberg Bay, with additional pockets of this climate inland of the Eastern Cape and KwaZulu-Natal coast. It is usually warm most of the year with no pronounced rainy season, but slightly more rain in autumn and spring. The Tristan da Cunha archipelago in the South Atlantic also has an oceanic climate. The oceanic climate is prevalent in the more southerly parts of Oceania. A mild maritime climate is in existence in New Zealand. It occurs in a few areas of Australia, namely in the southeast, although average high temperatures during summers there tend to be higher and the summers drier than is typical of oceanic climates, with summer maxima sometimes exceeding 40 °C (104 °F), Tasmania, Victoria and southeastern New South Wales. It can also be found along the western areas of the south coast of Western Australia, parts with steppe-like (BSk) or even desert-like (BWk) scarcity of precipitation. This climate is found on the Asian mainland in mountainous areas of the tropics, such as the foothills of the Himalayas and south-west China. Within Japan, the port city of Muroran is the only part of Hokkaido with an oceanic climate. Parts of the northeastern coast of Honshu, from Mutsu, Aomori towards Miyako, Iwate, also feature this climate. Île Amsterdam and Île Saint-Paul, both part of the French Southern and Antarctic Lands, are located in the subtropics and have an oceanic climate (akin to Tristan da Cunha; see above). The subtropical highland variety of the oceanic climate exists in elevated portions of the world that are within either the tropics or subtropics, though it is typically found in mountainous locations in some tropical countries. Despite the latitude, the higher altitudes of these regions mean that the climate tends to share characteristics with oceanic climates, though it can experience noticeably drier weather during the lower-sun "winter" season. In locations outside the tropics, other than the drying trend in the winter, subtropical highland climates tend to be essentially identical to an oceanic climate, with mild summers and noticeably cooler winters, plus, in some instances, some snowfall. In the tropics, a subtropical highland climate tends to feature spring-like weather year-round. Temperatures there remain relatively constant throughout the year and snowfall is seldom seen. Areas with this climate feature monthly averages below 22 °C (72 °F) but above −3 °C (27 °F) (or 0 °C (32 °F) using American standards). At least one month's average temperature is below 18 °C (64 °F). Without their elevation, many of these regions would likely feature either tropical or humid subtropical climates. This type of climate exists in parts of east, south and southeastern Africa, interior southern Africa and elevated portions of eastern Africa as far north as Mozambique and of western Africa up to the southwestern Angola highlands also share this climate type. The exposed areas of High Atlas, some mountainous areas across southern Europe, mountainous sections of North, Central and South America and in the highest parts of the states of Minas Gerais, Rio Grande do Sul, Santa Catarina, Paraná and São Paulo, in Brazil, some mountainous areas across Southeast Asia, parts of the Himalayas and parts of Sri Lanka. A climate type similar to this exists in the Northern Tablelands and Central Tablelands region of New South Wales in Australia, with more uniform rainfall distribution, and would have characteristics of the Cfa climate. They would also have a high diurnal temperature variation and low humidity, owing to their inland location and relatively high elevation. Temperate oceanic climates, also known as "marine mild winter" climates (themselves) or simply oceanic climates, are found either at middle latitudes. They are often found on or near the west coast of continents; hence another name for Cfb, i.e. "marine west coast" climates. In addition to moderate temperatures year-round, one of the characteristics is the absence of dry season. Except for the western part of Europe, this type of climate is confined to narrow ranges of occurrences mainly in the low latitudes and to the east of the continents where it appears in the form of "arch" accompanying elevations, as plateaus in the subtropics. It arises in both hemispheres between 35° and 60°: at low altitudes between Mediterranean, humid continental climates and subartic, although the latter usually are also grouped in marine climates limited by the east border of the ocean basins. The west winds ease temperatures, even if there is a partial participation of warm sea currents. With the air coming from the ocean predominates the cloudy weather with constant precipitation even in the colder months and the temperature is strongly enlivened. Depending on the continent its distribution is greater due to the absence of mountains in the north and south direction. Without a deep layer of snow and sufficient moisture the entire year the vegetation is usually always seeing under normal conditions. The vegetation is temperate with the presence of spruce, pine and cedar. As well as fruit, e.g. : apples, pears and grapes. In the hottest month the average temperature is below 22 °C, but it's in minimum four months with temperatures above 10 °C. The average temperature of the coldest month must be -3 °C or 0 °C (eastern United States) to avoid falling into a continental climate in interior areas or of less influence of the adjacent ocean. The average temperature variations in the year are between 10 and 15 °C with average annual temperatures between 7 °C and 13 °C if it is not a mountainous place. Rain values can vary from 50 cm to 10 times the minimum value by the orographic factor. It is dominated by frontal cyclones, where there are places where rainy days exceed 150 times a year. But contrary to popular belief, there are few storms and yes they at occurrences of the precipitation are in constant quantities. Another feature is the very reduced visibility in the winter. Cfb climates are predominant in central parts of Western Europe, including northern Spain, Northwestern Portugal (mountains), Belgium, Britain, France, Ireland and the Netherlands. They are the main climate type in New Zealand and the Australian states of Tasmania, Victoria and southeastern New South Wales (starting from the Illawarra region). In North America, they are found mainly in Washington, Oregon, Vancouver Island and neighbouring parts of British Columbia, as well as many coastal areas of southwest Alaska. There are pockets of Cfb in most South American countries, including many parts of Southern Chile, parts of the provinces of Chubut, Santa Cruz and Buenos Aires in Argentina. In Western Asia small pockets are found close to sea level on the Black Sea coast of northern Turkey and Georgia. While Cfb zones are rare in Africa, one dominates the coastline of the Eastern Cape in South Africa. The climate subtype can also be found in Nantucket, Massachusetts (in the immediate west and northwest in transition for humid continental, the remainder of Cape Cod ) and northeastern Georgia both in the eastern United States. Areas with subpolar oceanic climates feature an oceanic climate but are usually located closer to polar regions. As a result of their location, these regions tend to be on the cool end of oceanic climates. Snowfall tends to be more common here than in other oceanic climates. Subpolar oceanic climates are less prone to temperature extremes than subarctic climates or continental climates, featuring milder winters than these climates. Subpolar oceanic climates feature only one to three months of average monthly temperatures that are at least 10 °C (50 °F). As with oceanic climates, none of its average monthly temperatures fall below -3.0 °C (26.6 °F) or 0 °C depending on the isotherm used. Typically, these areas in the warmest month experience daytime maximum temperatures below 17 °C (63 °F), while the coldest month features highs near or slightly above freezing and lows just below freezing. It typically carries a Cfc designation, though very small areas in Yunnan, Sichuan and parts of Argentina and Bolivia have summers sufficiently short to be Cwc with fewer than four months over 10 °C (50 °F). El Alto, Bolivia, is one the few confirmed towns that features this rare variation of the subpolar oceanic climate. The more warm summer/cool winter variation of this climate type is also sometimes known as a "continental maritime climate" as it often has more in common with continental climates than with tundra climates, a great example of this would be Harstad, Norway, which like nearby Tromso has moderately cold, snowy winters and mild to warm summers making this somewhat of a cool summer version of a four-season climate. Mountain summits of Scotland, the South Island of New Zealand, Vancouver Island of Canada, Tasmania, Tierra del Fuego, and Patagonia expirence the sub polar variety, meaning that they have moderate to cool summers, and snowy winters. This variant of an oceanic climate is found in parts of coastal Iceland, the Faroe Islands, parts of Scotland, northwestern coastal areas of Norway such as Lofoten and reaching to 70°N on some islands, uplands near the coast of southwestern Norway, the Aleutian Islands of Alaska and northern parts of the Alaskan Panhandle, the far south of Chile and Argentina, and a few highland areas of Tasmania, and the Australian and Southern Alps. This type of climate is even found in the very remote parts of the Papuan Highlands in Indonesia. The classification used for this regime is Cfc. In the most marine of those areas affected by this regime, temperatures above 20 °C (68 °F) are extreme weather events, even in the midst of summer. Temperatures above 30 °C (86 °F) have been recorded on rare occasions in some areas of this climate, and in winter temperatures down to −20 °C (−4 °F) have seldom been recorded in some areas. ^ Lauren Springer Ogden (2008). Plant-Driven Design. Timber Press. p. 78. ISBN 978-0-88192-877-8. ^ Climate (19 June 2009). "Oceanic Climate". Archived from the original on 9 February 2011. Retrieved 30 January 2011. ^ a b Tom L. McKnight & Darrel Hess (2000). Climate Zones and Types: The Köppen System. Physical Geography: A Landscape Appreciation. Prentice Hall. pp. 226–235. ISBN 978-0-13-020263-5. ^ "The Gulf Stream". About Education – Geography. Retrieved 1 June 2015. ^ "Standard climate values for Pamplona". Aemet.es. Retrieved 9 August 2016. ^ M. C. Peel; B. L. Finlayson & T. A. McMahon (11 October 2007). "Updated world map of the Köppen-Geiger climate classification" (PDF). Hydrology and Earth System Sciences. 11 (5): 1638–1643. doi:10.5194/hess-11-1633-2007. Retrieved 30 January 2011. ^ Bureau of Meteorology (2011). "Climate of Canberra Area". Commonwealth of Australia. Archived from the original on 20 March 2011. Retrieved 30 January 2011. ^ "Average Weather in Muroran, Japan, Year Round - Weather Spark". weatherspark.com. Retrieved 28 July 2018. ^ むつ　平年値（年・月ごとの値）　主な要素. jma.go.jp (in Japanese). Retrieved 28 October 2018. ^ 小本　平年値（年・月ごとの値）　主な要素. jma.go.jp (in Japanese). Retrieved 28 October 2018. ^ Michael Pidwirny, 2017, Appendix 3: Köppen Climate Classification: Single appendix from the eBook Understanding Physical Geography. Kelowna BC, Canada; Our Planet Earth Publishing, pp. 8, 24. ^ a b "Temperate oceanic climate". www.mindat.org. Retrieved 11 October 2018. ^ a b Team, Glogster. "Marine West Coast: climate, coast, marine, west | Glogster EDU - Interactive multimedia posters". edu.glogster.com. Retrieved 11 October 2018. ^ a b "marine west coast climate | Characteristics & Facts". Encyclopedia Britannica. Retrieved 11 October 2018. ^ "Marine West Coast Climate". www.earthonlinemedia.com. Retrieved 11 October 2018. ^ "Hot Continental Division". www.fs.fed.us. Retrieved 11 October 2018. ^ "Mean Temperature US in January - 30 yrs (normals)". ^ "Georgia US Koppen Climate". ^ Tapper, Andrew; Tapper, Nigel (1996). Gray, Kathleen (ed.). The weather and climate of Australia and New Zealand (First ed.). Melbourne, Australia: Oxford University Press. p. 300. ISBN 978-0-19-553393-4. ^ "Estadistica Climatologica Tomo III (pg 512–537)" (PDF) (in Spanish). Dirección General de Aeronáutica Civil. March 2001. Archived from the original (PDF) on 17 April 2012. Retrieved 15 January 2013. ^ "Monthly means and extremes 1961–1990 and 1981–2010 for air temperature, atmospheric pressure, hours of bright sunshine and precipitation–Denmark, The Faroe Islands and Greenland" (PDF). Danish Meteorological Institute. pp. 16–19. Retrieved 18 January 2015.